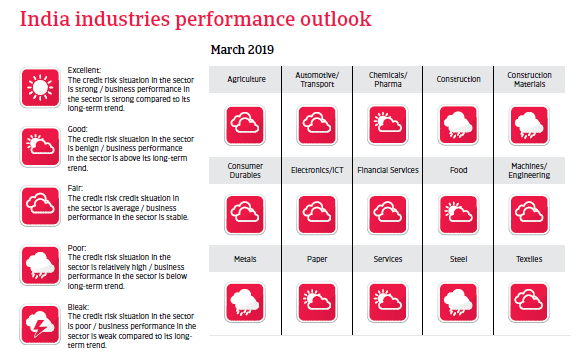 India´s economic outlook for 2019 and 2020 remains robust with about 7% growth, but a weak banking sector and high corporate indebtedness are concerns. The National Democratic Alliance (NDA) coalition, led by Prime Minister Narendra Modi’s Bharatiya Janata Party (BJP), remains in a strong position. It is expected to win the April/May elections, but as the coalition’s popularity has declined, it could lose its majority in the Lower House. This would imply that Prime Minsiter Modi has to look for support from other parties. The Modi administration has implemented several major reforms (e.g. the introduction of a nation-wide Goods and Services Tax, GST), which are improving the long-term prospects of the economy. The uniform GST system will create a single national market and enhance the efficiency of domestic trade. That said, reforms in land and labour markets will proceed only gradually at the national level, given strong political opposition from civil society organisations and labour unions. India’s foreign policy is driven by its aim to be the pre-eminent player in South Asia. New Delhi has deepened ties with the US and Japan, sharing with them the strategic interest of countering China’s growing influence in South Asia (e.g. Sri Lanka and Bangladesh) and the whole Asia Pacific region. The relationship with Pakistan remains tense, mainly due to the long-lasting conflict over the Kashmir region. 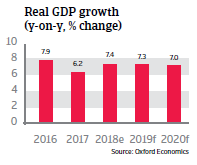 India is expected to again record high annual economic growth rates of about 7% in 2019 and 2020, mostly due to robust domestic demand (private consumption and business expenditures). Additionally net exports will positively contribute to GDP expansion, due to fiscal policies to curb imports, and a weaker rupee. Inflation is forecast to increase in 2018 and 2019, but to remain within the central bank’s target range of 2%-6%. Despite some improvements the quality of the Indian business environment remains relatively poor due to many structural deficiencies: an underdeveloped agricultural sector, poor infrastructure, inflexible labour laws, excessive bureaucracy, rigid land laws, and a shortage of skilled labour due to the poor education of most of the population. Trade frictions with the US (e.g. on Indian steel and aluminium exports) had only a small negative impact so far, but in early March 2019 President Trump announced his intention to end the preferential GSP trade treatment for India, which lowers US duties on Indian exports worth USD 5.6 billion. This could impact businesses in sectors such as gems, textile, processed foods and engineering. India´s trade deficit increased in 2018, leading to a current account deficit of almost 3% of GDP in 2018. This deficit is expected to decrease to a sustainable level of about 2% of GDP in 2019 and 2020, but rising oil prices remain a downside risk. India´s external position is comfortable, and both the country and sovereign risks remain low. External debt is low and decreasing while the liquidity situation is good, which makes the economy resilient to external shocks. India has an excellent payment record, with no missed payments since 1970, providing it with good access to capital markets. 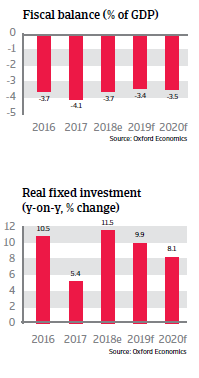 Fiscal consolidation is slowing ahead of the April/May 2019 general elections due to more spending for (voter-friendly) subsidies, welfare payments as well as infrastructure improvements (the government is investing in power infrastructure, one of the largest obstacles to India´s long-term economic growth potential). Revenues have increased, sustained by higher tax income and robust growth. The government is expected to resume its efforts to lower the budget deficit after the elections. Public debt will decrease gradually and remain sustainable. Additionally it can be widely financed by domestic borrowing and the maturity is long, which mitigates negative effects. Recent reports of banking frauds have led to renewed concerns about corporate governance, banking regulation and the true scale of non- performing assets. Worries about the general health of the financial sector increased after the debt default of a large infrastructure finance and construction company in autumn 2018. However, the government took over the company and guaranteed payments after the default in order to avoid spill over effects. However, a high level of bad debt is weighing on the balance sheets of Indian banks (mainly public sector banks), with non-performing assets estimated at more than 12% in early 2019. High corporate debt remains a risk for the Indian economy for the time being, and further deterioration of the balance sheets of corporations and public banks cannot ruled out. Despite this, the possibility of a systemic fallout in the financial sector is rather low as the government and the Central Bank would intervene in case of crisis. In the first nine months of 2018 the rupee exchange rate came under pressure, mainly due to the rising current account deficit and monetary policy tightening in the US, increased aversion to emerging markets risk and concerns about India´s financial sector. Capital outflows and currency volatility could persist in 2019, but the robust and relatively closed economy, contained inflation, sound reserve ratios and manageable external debt are dampening negative consequences of a weakening rupee on the economy. The profit margins of Indian non-food retailers are expected to moderate in 2018 due to growing competition and the rising market share of e-commerce.